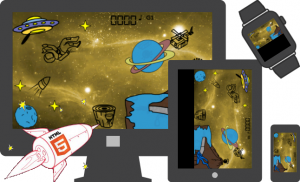 Creating games is the most exciting and challenging area of the software development. Once you have created the next hit game of the year, the challenge for your newborn baby is to support as many different platforms as possible since there are thousands of different devices out there. Thus, unless your target is a specific device, like iPhone, Android, Smart watch, Windows PC, Mac, etc. with previously known technical characteristics, then the need of such a wide support could become a real headache. An approach to this is to re-write the source code (or specific parts of it) for every platform using the SDK and the tools for this platform. Another approach is to write the game using technologies that come with the promise “write once, run everywhere”. One such very promising technology is HTML5. Orienting your coding habits into this direction, a cross-platform implementation becomes feasible. Actually, an HTML5 game (or application) runs inside a browser that supports this level of the markup language. Fortunately, almost every browser on any device of the last half decade can translate HTML5. You can play a game that I have created with HTML5 and combines all these promises. Just visit from everywhere the link bellow. If you open it from a desktop browser please keep changing the dimensions to experience the effect of responsive resizing in real-time. Now, let’s begin with the fun.